Celebrating its twentieth anniversary year, Jonathan Harvey's award-winning and much-loved urban love story Beautiful Thing returns to the West End starring Charlie Brooks. Beautiful Thing plays a strictly limited run from 3 June 2015 – 3 July 2015 at the Arts Theatre. The 2015 West End production stars Charlie Brooks as ‘Sandra’, Thomas Law as ‘Ste’ and Sam Jackson as ‘Jamie’ alongside Gerard McCarthy & Vanessa Babirye as ‘Tony’ and ‘Leah’. 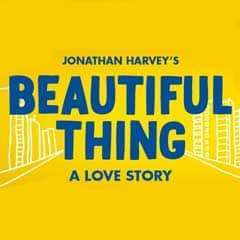 Set during a heat wave on a rundown Thamesmead council estate, Beautiful Thing is an urban love story full of characters that abound with attitude, energy, frankness and humour. The story follows Jamie, an introvert, troubled teen whose dislike of football is reason enough for his classmates to bully him at every opportunity. Living with his pre-occupied single mum, Sandra, Jamie finds himself infatuated with his next door neighbour and classmate Ste. Ste, who is living with his abusive, alcoholic father in the flat next door, is one night beaten so badly that Sandra takes pity and lets him sleep over. In the absence of a third bed, Ste has to make do with sleeping ‘top-to-toe’ with Jamie. Much to his delight, Jamie is able to provide Ste with the comfort and reassurance he craves and also a little massage with some peppermint foot lotion. The boys’ relationship is helped along by Leah, a sassy, Mama Cass-obsessed neighbour and Sandra’s dippy neo-hippy lover, Tony, as they discover themselves, each other and a Beautiful Thing. Jonathan Harvey deftly combines comedy with ardent drama in his critically acclaimed award winning play, and truly captures what it is to be sixteen and in the first full flush of love. The production stars Charlie Brooks as ‘Sandra’, Thomas Law as ‘Ste’ and Sam Jackson as ‘Jamie’ alongside Gerard McCarthy & Vanessa Babirye as ‘Tony’ and ‘Leah’. 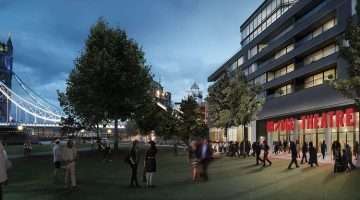 Jonathan Harvey’s play is directed by Nikolai Foster with designs by Colin Richmond, lighting by Ben Cracknell and sound design by George Dennis. Beautiful Thing will be a co-production between the Nottingham Playhouse, the Curve Leicester and Tom O’Connell for QNQ Ltd.
Why book Beautiful Thing tickets with us?